Clean is the new green for food labels in 2015 and beyond. According to new Mintel research, food labels are eschewing the terms natural and green for the coming years, instead latching on to a new term that encapsulates more than the environmental sustainability of the ingredients. 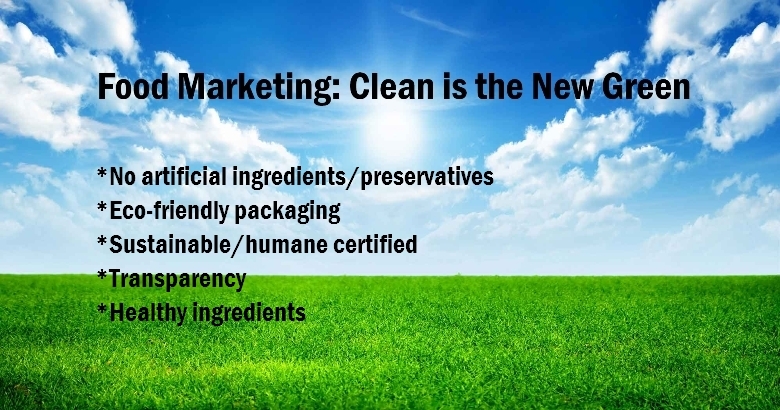 The term clean signifies not only a natural and healthful product but one that is also transparent, a new priority among consumers that’s growing across food categories and beyond. According to Mintel, 22 percent of U.S. grocery shoppers want product packaging to help them more easily identify healthier food products. Nutritionist Joy Bauer, of “Today Show” fame, called out “clean” as the trend for the near future, noting a consumer shift toward wholesome foods, and away from diet foods, when it comes to maintaining and improving their health. Clean may, in fact, encompass many of the claims consumers seek. “No additives” is the current top claim added to new products launched globally, which suggests consumers are, indeed, looking for less-processed products. Food origin is quickly becoming a leading purchase factor, according to Mintel, and 35 percent of consumers seek out products with a local claim that allows them to learn more about the provenance of ingredients. But while the term is increasingly used to describe and promote products, “clean” doesn’t have a standardized definition in the industry. Producers use the term for claims as varied as triple-cleaned organic kale and buffalo mozzarella with a “clean” flavor. To rein in the word’s broad use, Prevention magazine’s Cleanest Packaged Food Awards boasts a criteria of five detailed points, including BPA-free packaging, Monterey Bay Aquarium sustainability approval for seafood, and avoidance of genetically modified organisms. Sass, who authored the upcoming clean-eating book, Slim Down Now: Shed Pounds and Inches with Real Food, Real Fast, noted that clean eating is focused on quality first, and not letting marketing terms like low-sodium and sugar-free distract the consumer. She recommended brands be authentic and transparent about their products, from sourcing and manufacturing to packaging and marketing. Your food doesn’t use artificial ingredients or added preservatives. Consumers can pronounce and recognize each ingredient. Your product comes in environmentally friendly packaging, such as BPA-free plastic or biodegradable materials. Ingredients used are sustainable, local, environmentally friendly, and organic. Animal proteins are humanely raised, and fish species are included in the Monterey Bay Aquarium’s sustainable seafood list. Your company can answer questions about the complete production and supply chain, and knows where every ingredient is at virtually every stage possible in the production cycle. You can explain the presence of every ingredient in the product, and any health claims to promote the product. ← Embarrassed by the Look of Your Website?